* parking: on request, it is possible to have, in a paid parking, equipped and controlled H. 24, a parking space. The parking, "Parcheggio Mercato Trionfale", is located right in front of the apt (30 meters). The house is beautiful and cozy: - parquet everywhere; - the high ceiling m. 3.50; - the fully equipped kitchen has modern furniture; - in the living room: valuable, antique furniture, contemporary with the "Liberty" building; a round and carved walnut table, a very modern, comfortable double sofa bed; - two delightful bedrooms: one "Large Blu" room and the other a "Romantic" room with private bathroom; - two comfortable bathrooms, with artistic majolica: from Amalfi / Vietri one, the other with beautiful TULIPS of a Dutch designer; - air conditioning in all rooms; - lift; - on the top (6th floor) there is a condominium terrace, accessible to the tenant, who will have the keys: she/he can sit in complete relaxation, admire the view, have a drink, and especially admire the Dome of St. Peter. On the terrace there is also the possibility, typical of Rome, to hang clothes under the sun, in the wind and have them dry, in short, in a very hygienic way. A historic (1900) sidewalk, ALBERATO (centenarian plane trees), wide m. 11: the only one in Rome so wide, where you can walk for more than 3 km, considering that Via Andrea Doria continues on Viale delle Milizie which is also wide, tree-lined, wonderful road that leads to the Tiber and then to Piazzale Flaminio and to Villa Borghese, a wonderful park, one of the most beautiful in Rome and that represents a healthy lung for the city. Via Andrea Doria is also called Boulevard Andrea Doria for the wealth of its numerous and excellent bars, pizzerias, restaurants, ice-cream shops, which have tables outside and inside. My family loves this apartment that we are now happy to rent to tourists who, I am sure, will appreciate it and will love it, like us. As soon as the tenant sets foot in this elegant home, he/she will enjoy the apartment, appreciate and respect it. The two Bathrooms are very ELEGANT: 1. TULIPANI w/fine ceramics by the Dutch designer, Van Der Hilst. It has a bathtub with a shower, the round sink is positioned on a precious slab of Green Marble from Guatemala; 2. AMALFI/VIETRI w/ fine, elegant, hand-crafted majolica; it has a charming, very Italian style. The round sink rests on a precious slab of Yellow Atlante Marble. The SEA near Rome: - trains, every 20 ', to Rome ONLY 21'; even buses are convenient; - car: 30 '/ 40', convenient dual carriageway. I will be happy to give ALL the necessary information. Information for people with a disability: there are 7 steps before arriving at the elevator which arrives at the 5th floor. The apartment is on the 3rd floor. The terrace on the 6th. There is no pool that belongs to the Condominium. There are, however, pools in the surroundings, some beautiful, where I also go, for which you pay a ticket. The location was perfect and the apartment was spacious and clean! Miana was extremely helpful with everything and went out of her way to make us feel at home! Can't wait to go back! Plenty of restaurants nearby with excellent food! Thanks Miana!! This is a lovely apartment, decorated to a very high standard and in a great location. We stayed here with our 2 young daughters. It is in a great location a few minutes from the Vatican and metro station so getting around Rome was very easy. The apartment is also opposite Rome's food market with daily fresh produce for snacks and picnic lunches. The apartment is spacious, well equipped and the beds are very comfortable. Miana was a great hostess and source of information. She was able to recommend things to see and great restraunts for meals. It was lovely to spend time with her and fascinating to hear her stories of Rome. We would happily recommend this apartment and hope to stay here again in the future. Thank you very much for your generous words about my beautiful, comfortable home, its great location, in the exclusive Prati/Vatican area, and also about myself. It was a great pleasure to have you here along with your wonderful daughters, Megan and Beth, two smart little girls, cheerful, polite, respectful. Congratulations, I'm sure you are proud of them. It was a great pleasure as well to make yourself at home and give you all the information you needed to make your Roman holiday as pleasant as possible. In the evening, then, it was a real joy to receive your WhatsApp message in which you, happy for the beautiful day around Rome, kindly informed me of all the places you had visited. Thanks also for letting me know that I was able to meet your needs as a tourist, eager to know about the Eternal City and to learn about the area where you were living, Prati/Vatican that, as you yourself had the chance to see, offers numerous, excellent Restaurants, Ice-cream parlors, Patisseries, Pizzerias, without forgetting the amazing, picturesque, vast and hygienic, indoor MARKET, just across the street, “Mercato Trionfale”, which, at competitive prices, offers an infinite quantity of high quality products coming from all over the world as well as from the countryside and the sea around Rome ( Km. 0). I want to say, with all my heart, that I am very happy to have now four more friends, in the UK, Jo, Mike, Megan, Beth and that my home will always be wide open, when you decide to come again. What to say, finally, of the beautiful bouquet of FLOWERS that you kindly gave me the night before leaving? I am still moved. THANK YOU A LOT. I would GREATLY recommend, to all Homeaway owners, to warmly welcome this SPECIAL, FRIENDLY FAMILY. I'm sure, every owner will be happy to have this wonderful family as a guest. Miana is a wonderful hostess! The apartment is clean and spacious. Thank you, thank you so much for your kind words about me as a wonderful hostess. I was also very happy that you and your beautiful family enjoyed my spacious and clean apartment. Let me tell you that it was a real pleasure to meet you, your nice sisters, Christine and Theresa as well as Charles, your very kind son. All the best and a very special kiss to Christine. Danut's family is a wonderful family, everyone is kind, friendly, generous, very polite and respectful. What impressed me is their generosity and love for their parents: in fact a young couple, Danut and Mirela, and a young lady, Ana, who already knew Rome, came back to introduce the Eternal City, to the their parents, Lucia and Gheorghe. I want to congratulate these modern young people for their sensitivity. I am very happy to have met this family and, if they return to Rome, I will be very happy to host them again: a homeowner cannot wish for anything other than having people as responsible as this wonderful, loving family. As a homeowner, I am very satisfied with the experience I had with Danut's family and I recommend all the home owners to welcome them with joy because they will be happy to meet them, very special people. Passare la settimana di Capodanno in questo appartamento è stata un'esperienza memorabile; il valore aggiunto è stato vivere la terrazza condominiale durante i fuochi d'artificio che hanno circondato Roma l'ultima notte dell'anno, tutti visibili da quella posizione già privilegiata per la fantastica vista del Cupolone. 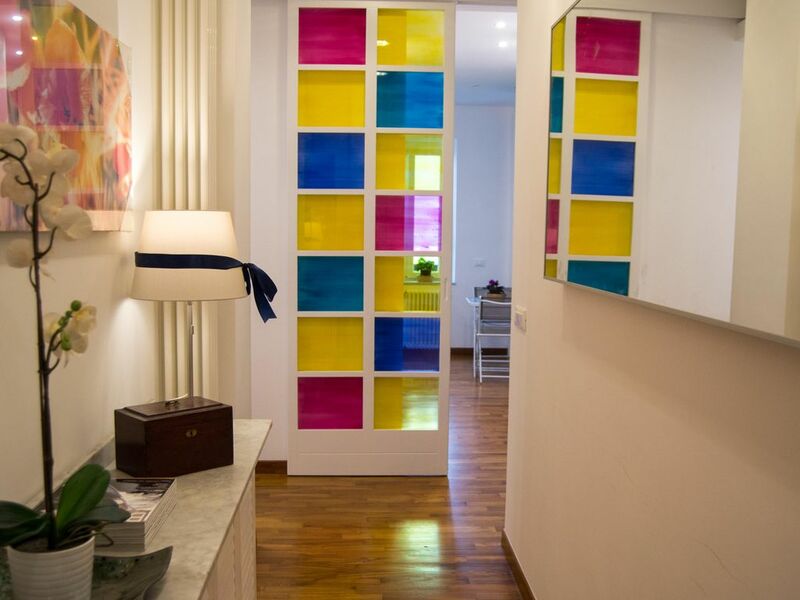 L'appartamento è nuovo, luminoso, caldo, arredato con gusto e con ogni confort. E' stato ideale per 2 coppie, come noi, per la presenza di due bagni e una zona comune (cucina e soggiorno) dove poter godere della compagnia. La zona ci ha sorpreso positivamente essendo vicinissima ai musei vaticani e ben collegata al centro con i mezzi pubblici di superficie e metropolitani; arrivare a piedi nel cuore di Roma è una passeggiata piacevole anche a piedi. Il "mercato Trionfale" appena di fronte all'appartamento ci ha fatto godere dei sapori genuini del luogo. Intorno è possibile mangiare bene, spendendo il giusto. La padrona di casa, Damiana, è stata accogliente, ci ha dato ottimi consigli per il nostro soggiorno in città, accogliendoci con simpatia e disponibilità. Grazie per le splendide parole che avete rivolto: alla mia casa, all’area ove questa è posta, alla terrazza su all'ultimo piano, a Roma, a me, al “Mercato Trionfale”, un vero “Paese delle Meraviglie”, proprio accanto alla Cappella Sistina - Vaticano - San Pietro. Grazie anche per avermi inviato lo splendido video, ripreso dalla suggestiva terrazza condominiale ove, ho appreso con gioia, avete festeggiato l'arrivo del 2019 mentre Roma si illuminava di affascinanti fuochi d'artificio, tutti visibili a 360° dalla terrazza che ha una vera "posizione privilegiata anche per la fantastica vista del Cupolone". È stato un grande piacere aver avuto la fortuna di ospitare Cristina e Massimo, Antonina e Andrea: due splendide coppie di insegnanti, amici tra loro da molti anni, persone assai piacevoli, positive, gentili, allegre ed entusiaste. Stando vicina a queste due simpatiche coppie ho respirato la loro gioia di vivere la “Vacanza Romana”, il loro interesse nel voler conoscere, conoscere… assieme alla grande intesa, all’affiatamento ed all’armonia che regna tra loro. Intesa, affiatamento ed armonia che si sono ben riflesse nel rapporto che, come proprietaria di casa, ho avuto con loro: un rapporto schietto e piacevole, fatto di simpatia, di gioia nello stare insieme, di una significativa intesa, di grande stima reciproca. Ai proprietari di casa dico: spalancate la porta della vostra abitazione a queste due meravigliose coppie ed accoglietele al meglio perché, sono sicura, sarete felici di averle come ospiti, sono persone affabili e soprattutto molto rispettose della casa, scrupolose, attente, in una parola persone affidabili. E poi... non c’è niente di più bello, per chi si dedica a rendere la casa il più possibile accogliente per i propri ospiti, sentirsi, da questi, riconoscere esplicitamente l'impegno profuso: musica per le mie orecchie, musica per le orecchie di ogni proprietario! Grazie a tutti, è stato un grande piacere avervi conosciuto, un’esperienza appagante, se tornerete a Roma sarò molto felice di ospitarvi nuovamente. Cette famille est une belle famille, je suis très heureuse de les avoir rencontrés et de les avoir comme invités car ils sont tous très sympathiques, polis et généreux. Un propriétaire ne peut rien souhaiter de mieux que d'avoir des invités respectueux, responsables et très aimables comme cette famille, une expérience particulièrement enrichissante. Je tiens à féliciter M. David, le père et Mme Stéphanie, la mère, pour leur courtoisie exquise et je tiens également à les féliciter pour leurs enfants Lucas et Louis, dont ils doivent être fiers parce qu'ils sont des garçons très gentils et polis. Questa famiglia è una bella famiglia, io sono molto contenta di averli conosciuti e di averli avuti come ospiti perché sono tutti molto affabili, educati e generosi. Un proprietario non può desiderare di meglio che avere degli ospiti rispettosi, responsabili e molto simpatici come questa famiglia, un'esperienza particolarmente appagante. Io voglio fare i miei complimenti al Signor David, il padre, ed alla Signora Stéphanie, la madre, per la loro squisita cortesia e voglio anche fare loro i complimenti per i figli Lucas e Louis, dei quali devono essere orgogliosi perchè essi sono dei ragazzi molto gentili ed educati. This family is a beautiful family, I am very happy to have met them and to have them as guests because they are all very friendly, polite and generous. An owner can not want anything better than having respectful, responsible and very nice guests like this family, a particularly fulfilling experience. I want to congratulate Mr. David, the father, and Mrs. Stéphanie, the mother, for their exquisite courtesy and I also want to congratulate them for their children Lucas and Louis, who they must be proud of because they are boys very kind and polite. CAR NOT NEEDED. How to get to Via Andrea Doria? - with taxi, prices are fixed, from Airport: 1) FIUMICINO € 48; 2) CIAMPINO € 30. One baggage is included..
- has a CYCLE PATH network, right in front of the apt, a network that leads everywhere: inside and outside Rome. However, on request, there is a convenient garage, watched over H. 24/7 parking, right across the street.. Via ANDREA DORIA in the exclusive, comfortable, safe, elegant "PRATI" district, adjacent to the Vatican / Sistine Chapel, m. 80: is one of the districts of central Rome, is famous for being the area of: shopping, with shops of Italian style; of business with all kind of offices; fun because of the numerous Restaurants, Clubs, Wine Bars, Ice cream parlours, Pizzerias; of walks because Via Andrea Doria is illuminated, safe, tree-lined (centenarian plane trees), you can walk there day and night, pleasantly, in complete safety. There is a historic sidewalk, on each side of the "Via", m. 11 the largest in the City. Via ANDREA DORIA is a "boulevard" with giant, beautiful plane trees: EXCELLENT Restaurants, Bars, Pizzerias, Bistros, Wine Bars, Ice-cream parlours where you can pleasantly sit inside and / or outside. The "PRATI" district was built after the Unification of Italy (late 1800) with architectural principles that refer to Pierre Charles L'Enfant, the famous Franco-American military engineer who designed Washington, DC, Project known as "L 'Enfant Plan "(1791) which then inspired Paris with its Boulevard, Turin and Rome, with the PRATI district. * Https: //fr.wikipedia.org/wiki/Prati; (French version, reduced). "PRATI" is therefore an elegant shopping area, par excellence, lively and fashionable; qualified shops and department stores: high quality, national and international food products; numerous supermarkets, some very close to the apt, open H. 24/7. All "PRATI" and, in particular Via ANDREA DORIA, must underline it, it is a quiet and safe area but at the same time VERY LIVING. In the area there are important health centres such as hospitals, emergency services, clinics, public and private clinics. There are numerous pharmacies in the area of ​​Via Andrea Doria which, among other things, represent valid health care centres to which you can rely with confidence because, pharmacies in Italy, are, as it is well known, important health reference points. A few steps from the apt. there are at least two pharmacies H. 24/7. In the area, there is even more: Offices of all kinds, all the Courts; RAI; Court of Auditors, Barracks, many Italian and American schools and universities: Lumsa 15', St. John's university 15', La Sapienza University, architecture 20', Auditorium Conciliazione; Parco della Musica (concerts), Theatres; Cinema; gyms, along with the PRIVILEGE to walk on the wide (11 meters), historic sidewalk, Via Andrea Doria (m.11), surrounded by rows of wonderful, very tall plane trees centenarians. In front of the apartment, there is a vast, ASTONISHING, picturesque, lively, indoor food market, modern and clean, the best in Rome, the "MERCATO TRIONFALE" of Via Andrea Doria.